As a young boy I had two great loves, LEGO and Lord of the Rings. I devoured the Lord of the Rings books and played every Lord of the Rings game. I even watched the awful The Hobbit movie from 1977 (I didn’t enjoy the new Hobbit trilogy much either though…). When it came to LEGO my passion was even greater than that I had for Lord of the Rings. I loved that I could create my own worlds and play in them. I had buckets of LEGOs and dumping them out on the floor to dig through and find the perfect piece was a favorite pastime. I now have two young children that aren’t quite old enough to watch the Lord of the Rings movies and who will never be subjected to the orignal The Hobbit. They both love LEGOs and have already started their own collections. 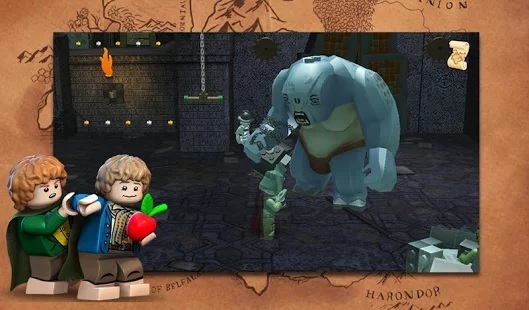 So it was with great excitement that I decided to download the new LEGO Lord of the Rings from the Play Store to share it with them. It was the perfect blending of both worlds on a level we could all enjoy (and that my wife would approve of)! You start out the game with a quick cut scene introducing you to to the world of Middle Earth and telling you the history of The Ring. Rather than the full poetic intro from the books you get a simplified version that is made for the children. You are quickly thrown in to the game with a quick tutorial showing you how to use your characters, the different movement options and the basics of the game. Once you have fought the initial battle you are thrown right in and begin the quest to destroy the ring. The game played very well on my NVIDIA Shield Tablet as well as my Nexus 5X. Both played without any issues whatsoever. For kicks and giggles I got out my old Note 2 and was able to run it without issue there as well. To make things more fun my son had the idea of having me take the game and then cast it to the TV through my connected Chromecast. Both he and my daughter sat on the couch while I played and loved watching not only the game but the cut scenes. It surprised me when my wife, who hates Lord of the Rings and games in general, came in and sat down on the couch with us. She expressed a genuine interest in it and actually stayed there and watched for a bit! My son tried out the game himself but quickly got frustrated with some of the controls. Once we practiced a bit together he got the hang of them but then got upset again when he couldn’t figure out how to get around certain obstacles. The obstacles often have tips to help you but my son is still learning to read and couldn’t read them fast enough. Here’s one tip that both my son and I would have found useful and would have spared us both a lot of frustration. If you see random piles of LEGO blocks sitting on the ground that jump around when you get close to them, you need to go stand over them and hold down the little lightning bolt icon. There were no tips in the game telling us to do this and we spent a good half hour trying to figure out how to get past the very first section. Things are much better now though. I would recommend it for any fan of LEGOs or Lord of the Rings. Get it from the Play Store quick!